Approved CAR T-cell therapies have led to remarkable regressions in cancers of the blood and bone marrow, so-called liquid cancers. 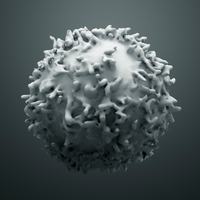 Scientists are now hoping to apply CAR T therapy to treat solid tumors. Both types of cancer present challenges. Heterogeneity Cells of a solid tumor do not all present the same mix of antigens on their surfaces, so a given CAR will likely miss some of the cancer. 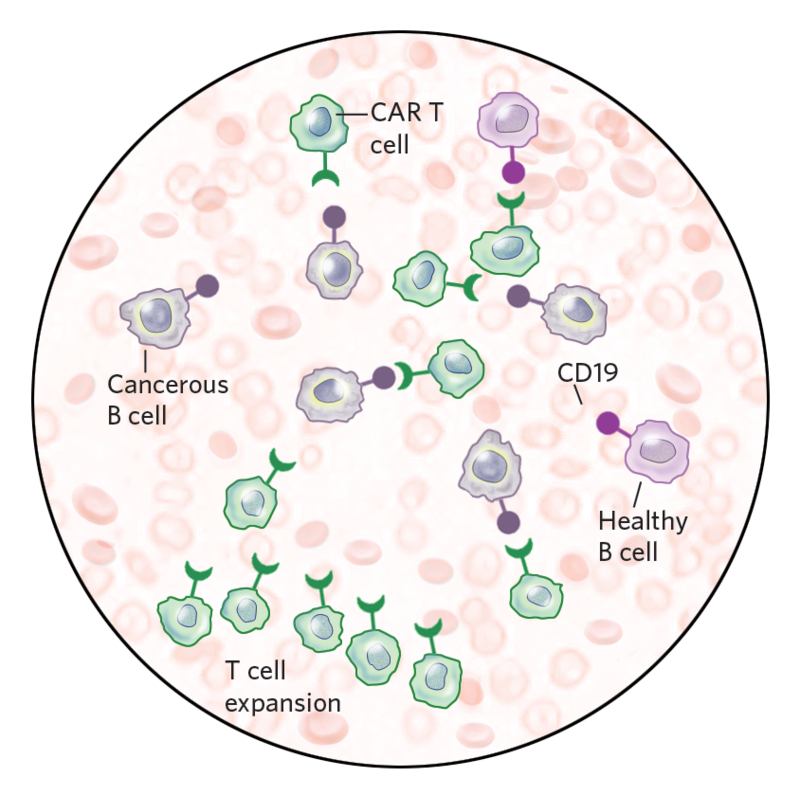 Although all cancerous B cells present the CD19 antigen targeted by approved CAR T therapies, normal B cells do as well, which can lead to severe side effects when healthy cells are destroyed. Microenvironment Solid tumors produce immune-suppressing agents such as the checkpoint molecule PD-L1. 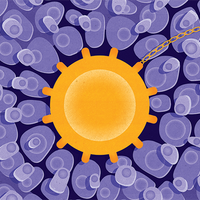 The blood is T cells’ home turf, and engineered CAR T cells readily expand once they are introduced into circulation, although an immune overreaction by the cells can lead to cytokine release syndrome. 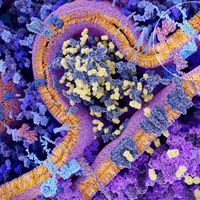 Delivery A solid mass of cells thousands of layers thick is difficult for T cells to infiltrate. 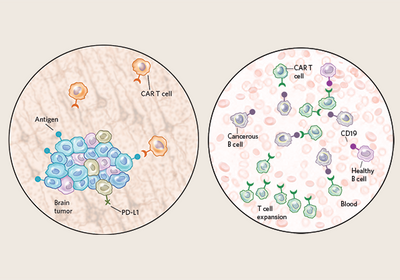 While some trials deliver the cells systemically, others aim to improve efficacy by administering CAR T cells directly to the site of the tumor. 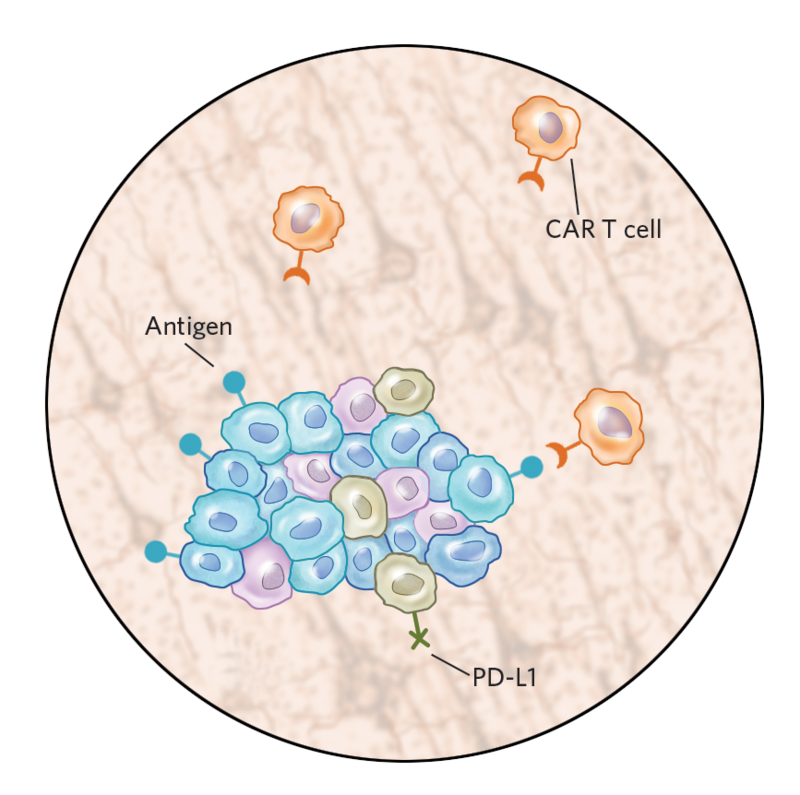 Approved CAR T therapies are infused into the blood where they can easily access malignant B cells.